The best coffeehouse in town is on your countertop with the Ninja Coffee BarTM brewer. Ninja's patent-pending brewing technology is designed to deliver better, richer- tasting coffee with variable richness levels that are never bitter. Only the Ninja Coffee Bar brewer has Thermal Flavor Extraction, which truly unlocks the full flavor potential of your coffee using automated controls for Temperature Calibration, Pre-infusion & Coffee Saturation. Only Ninja® Auto-iQTM One-Touch Intelligence allows you to CHOOSE A SIZE, CHOOSE A BREW. CHOOSE A SIZE - Brew directly into your favorite cup, travel mug or make a half carafe or full carafe. CHOOSE A BREW - At the touch of the brew button, Thermal Flavor Extraction enables you to dial up flavor richness from Classic Brew to Rich Brew to Over Ice Brew in the size you want. You can also select Concentrated Coffee for hot and frozen blended specialty coffeehouse style drinks. Classic: Smooth, balanced flavor from your favorite coffee. Rich: Richer, more intense than Classic, but not bitter coffee flavor that stands up to milk/cream. Over Ice: Specially designed to brew hot over ice to lock in flavor for a freshly brewed iced coffee that is not watered down. Specialty: Super-rich concentrate designed to create hot milk-based, iced, and frozen blended coffeehouse-style drinks. Auto-iQTM One Touch Intelligence draws just the right amount of water needed from the reservoir, based on the brew size you choose and brew type you select - so you get the right flavor to extract to achieve just the strength you want for each drink you make. 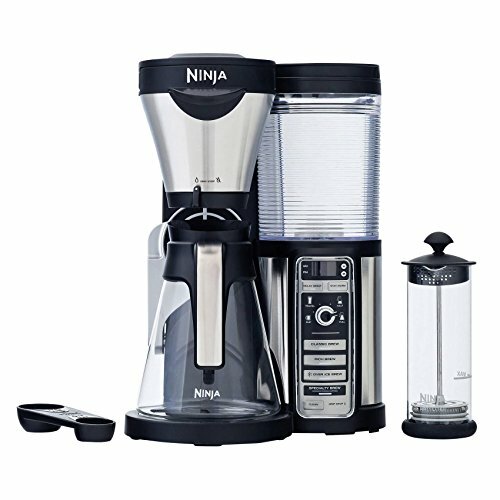 The Ninja Coffee Bar brewer also comes with the Ninja Easy FrotherTM, which froths milk and cream for making delicious coffeehouse-style drinks, such as latte-style drinks, cappuccino-style drinks, or even iced blended drinks.